Today I’m gonna show you how to install the Hybrid Application Toolkit (HAT) on a Windows machine. Hybrid Application Toolkit (from now on simply HAT) is the tool which allows you to deploy SAP Hybrid applications on mobile devices. Hybrid application (also known as Kapsel applications) can be created by using SAP Web IDE and then deployed on mobile devices with this tool. In order to get more information on this tool and on SAP Web IDE I suggest you to give a look to this page (SAP Web IDE – Overview). Here you can find a lot of other useful resources for SAPUI5 application development. This blog is just for Windows: if you want to know how to do the same on Mac please also follow this blog: How to install Hybrid Application Toolkit (HAT) on Mac. HAT installation is NodeJS based: it guides you through all the steps for a successful result. However in order to avoid the needing to start the installation and then going back and forth installing the missing components, with this blog, I’m giving you a sort of good starting point so that when you start the HAT installation it will be as smooth as possible and you will be no longer required to leave the installation process for installing other mandatory software. All the commands in the Terminal window must be executed WITHOUT administrator’s rights, otherwise you won’t be able to perform HAT setup. So, let’s focus here just on the first part! Java Development Kit is required by the Android SDK, so as first step we need to install this component. In this guide I’m using JDK 8, but 7 is fine as well. download the stand-alone version of SDK without the Android Studio. In this guide, I’ll follow the second approach, but the first one is fine as well: just write down the path where the bundled SDK tool is installed. 12) The SDK manager starts: if you get an error like this, it’s because most probably you are behind a firewall and you need to configure your proxy settings; so click on Close and read the APPENDIX to this section named Configure proxy for Android SDK Manager. 15) The installation of the required packages starts. It might require some time depending on your network speed, so be patient. If you get an error saying “Stopping ADB server failed (code -1)” at the beginning of the installation process, don’t worry, it’s normal! 17) We need to create an Android Virtual Device(AVD) in order to test our Android applications. Of course, this shouldn’t be mandatory, because I could test my applications just by using my Android phone, but at moment the HAT setup looks for it, so we need to configure it. In the future probably this won’t be a mandatory step. 21) You can close the tool. NOTE: Using the Android Emulator with this kind of ARM processor might result very slow. I suggest you to use (if possible) Virtual Machine Acceleration as explained here. In this way you can have a better emulated device for your development. The latest version at the time I’m writing this guide is 1.9.6. Good job so far! Please continue with the part 2 of this H2G! thanks for the great blog, but could you please post the exact version prerequisites, because here you are installing all the latest components, but I do have most of them already installed on my computer. Do I need Windows 8.1 machine, or it is also possible to install it on Windows 7? The installation process, however, which is web based, will guide you through the installation of all the missing or old components you have on your machine. You can start the installation and do a preliminary check to see what is missing and what is not up to date. i fixed the above issue, but now in the web based installation check, I get issue in the Cordova Build Android Project with Error: “please install android target : “andoird-22”. For Andoird 5.1.1(API 22), i do have installed the SDK Platform, I also have installed the latest Andoird SDK Platform and Build-tools. Thanks to Simmaco, we solved the above issue. For the Android version, somehow I had 2 Android SDK installed, so the path pointed to the wrong one, so I just needed to add the right path. npm -g install C:\KapselSDK\cli (or you installation path) to install the new version. What do you mean that you just had to add the right path? My ANDROID_HOME path is correct. Why do we need some local tools while developing in WEB IDE??? Are there any plans privide cordova build in the cloud? Starting from the minute 34 you can see it. I installed HAT as described in this and the preceding tutorials. Then I used web IDE to convert a SAP UI5 app to a Kapsel app. The app is very simple it displays a dropbox and displays some text depending on the selected entry on the dropbox. The app does not use ODATA. I ran the app as Web Application in WEB-IDE. It works there. Then I deployed the app on the device. I did not select any plugin. I can see that the app is available in the SAPHybrid directory on my local pc. When I use web-ide to run the app on an Emulator I see in the WEB-IDE console that the apk file is built and the app is installed successfully on the emulator. However when I click on the icon for the app in the emulator a white screen is displayed and then the following error message is displayed in the emulator: Application Error The connection to the server was unsucessful. (file:///android_asset/www/index.html). in order to debug the app you need the Android Device Monitor. If you have installed all correctly, you should be able to call it by typing “monitor” in the Command prompt window. I have to mention that I converted a UI5 app to a Kapsel app automatically in web-ide. When I start the Kapsel app it is working in web-ide. The app is quite simple it contains just a field with a combobox and a form for the text output. The app neither uses ODATA service nor a kapsel-plugin/cordova-plugin. Therefore I did not specify an ODATA service and I did not specify any plugin when deploying the app to device. I checked the project folder on my local PC C:\Users\…\www\resources: It does not contain the files which are mentioned in the error messages (e. g. library-preload.json). As far as I understand are the missing files system files. From where can I get the missing files and how can I include the missing files into the deploy process of the HAT in order to solve the errors described above? are you able to send me in some way your application? You can export it from SAP Web IDE and send it to me. There the file sap-ui-core.js is located. * (c) Copyright 2009-2015 SAP SE or an SAP affiliate company. * Licensed under the Apache License, Version 2.0 – see LICENSE.txt. a) Does the android app consist only of components covered by apache licence version 2.0? b) Does the app contain also sap components which are not covered by that licence (e. g. sap components for which I have to buy a licence in order to be allowed to distribute the app)? I developed a kapsel app and I can run that app on an emulator. In the popup I select the radio button for ‘Test Key’ and press the ‘OK’ button. Then another popup appears saying ‘WARNING: No device found! Try to use emulator. However an Android Device (Samsung Galaxy S2 mobile phone) is connected to the PC via USB. I downloaded the Samsung USB driver and installed it on the PC. From the windows explorer I can access the S2 mobile phone which is connected to the PC via USB. Therefore I assume that the USB connection between PC and S2 mobile phone is available. However when I go to WEB IDE and try to run the app on an Android Device I get the warning: No device found (as described above). Did you encounter a similar problem? Any help would be appreciated. maybe it would be better if you could ask these kind of questions by opening a new Discussion marked as a Question with your issue. It will get better visibility and it is also the proper way to proceed. However, regarding your problem I never experienced such kind of thing and I’ve also tried with a couple of Android devices. Have you tried with another one? Did you check if the Google USB Driver is properly installed and configured as described here OEM USB Drivers | Android Developers ? I have a doubt, I have created an app which consists of charts(i.e vizframe charts), it runs on the web perfectly, but when I tried it running on android phone after converting it to .apk, it didn’t recognize viz libraries. So, is the fault on my side or is it not supported? Viz is supported. Do you mind to share the project or give me more information about the error that you can capture in the background? You can write me in private. First of all, thank you Simmaco Ferriero for this very detailed how-to-guide! That is some excellent and useful work! There is a small directory change. The new one “\modules\KapselFramework\smp-plugins-dist” is equivalent to “\modules\KapselSDK” in the guide. Version 5.4.1 is required (already mentioned here: https://help.hana.ondemand.com/webide_hat/frameset.htm?d2865598e67f4ddabc79e5943352b0a1.html ). Go to: https://nodejs.org -> “Downloads” -> “Previous Releases” -> “5.4.1 Downloads”. As you can see, these are mostly minor remarks, but the newer versions of Node.js and Cordova were inevitable during my installation. Thanks! I’ll try to update my blog taking your suggestions into account. Do you know why node.js is still 5.4.1? Is there a chance to use 8.x.x? I know there were some plans about the HAT as a Cloud version? unfortunately I have no news regarding this. Probably we still need to wait. make sure you are able to navigate on internet from your Android device. Secondly, I’m not sure why you are having an error on “main.html”. The first page to be loaded should be “index.html”. Could you please try by creating a new very basic app from SAP Web IDE starting from the SAPUI5 Application template? we are getting an error plz suggest. 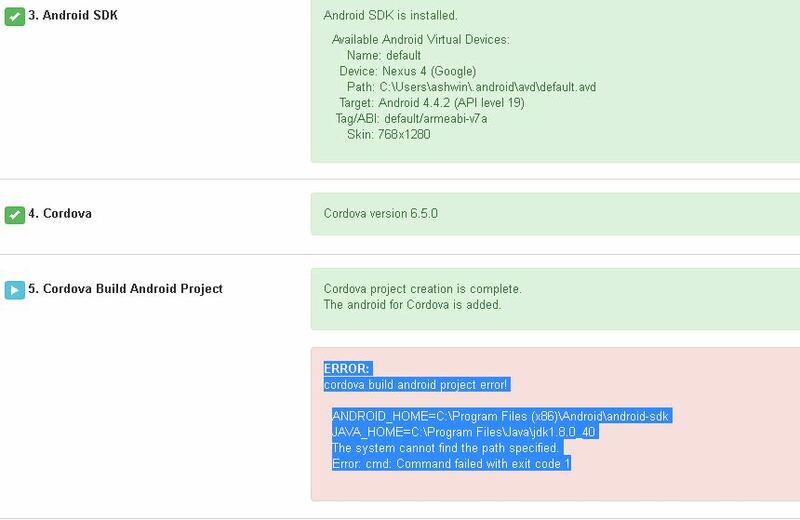 cordova build android project error!